It has been gloriously hot outside this past week and my thoughts (and cravings) have turned to fresh fruits, salads and veggies. We had our first barbecue of the season this past Sunday. 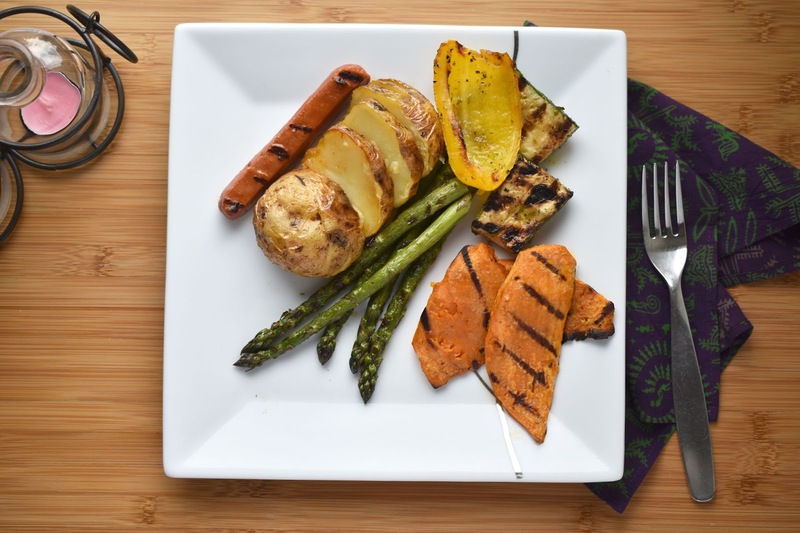 My husband barbecued sweet potatoes, asparagus, zucchini, peppers, potatoes, veggie hotdogs and veggie burgers. That's my plate, above. I opted not to have a burger because I just really enjoyed all the veggies. And I ate my hot dog without a bun because I feel like eating "lighter" when it's warm outside. 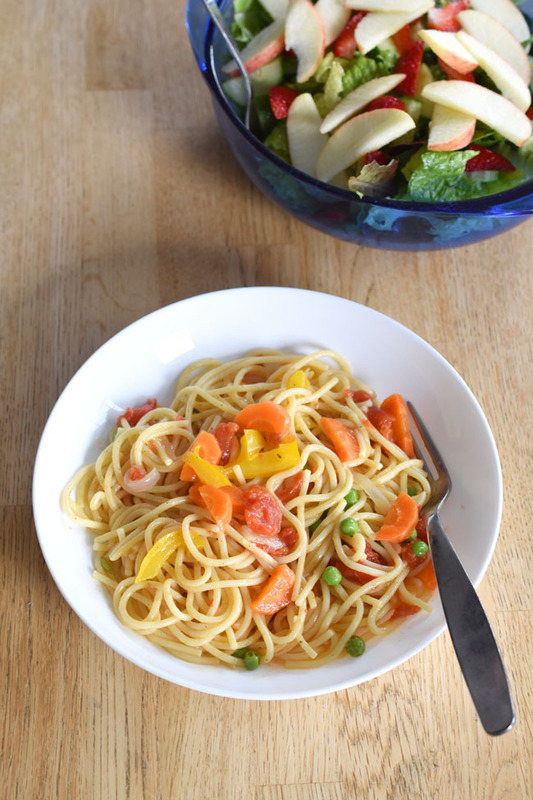 I also had a craving for pasta primavera one day. I made a quick, one-pot primavera with peppers, carrots, canned diced tomatoes and peas. We ate it with green salad topped with apple slices and strawberries. Come summer, I start throwing fresh fruit on everything. For breakfast I have often been eating Jordan's Morning Crisp Wild About Berries cereal. 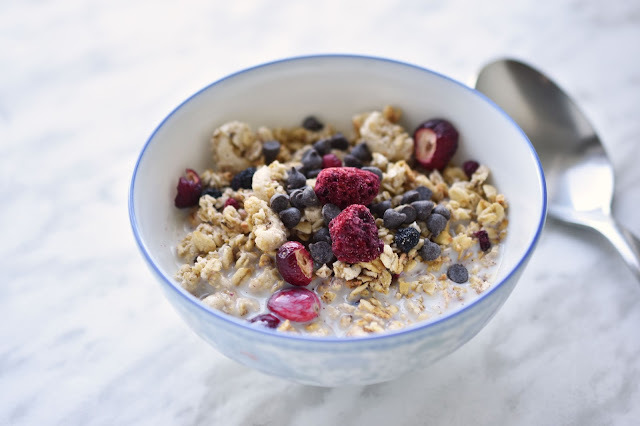 It has good chunks of freeze-dried raspberries, cranberries and blueberries. I throw on some dairy-free chocolate chips for added fun too and drown it all in soy milk. 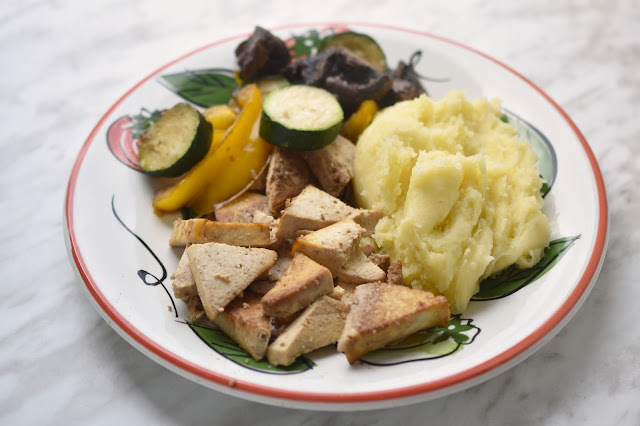 If I'm not sure what to cook, I often fall back on my Easy Weeknight Baked Tofu. Just before it got so hot, I made some along with roasted veggies and mashed potatoes. The kids can't get enough mashed potatoes! Genuine Health sent me a bottle of their Vegan Greens+ O to sample. It's an 80% organic, whole food blend of healthy things like spirulina, vegetables, fruit, chia seeds, brown rice, seaweed, green tea leaf extract and more superfoods, with the addition of stevia for sweetness. 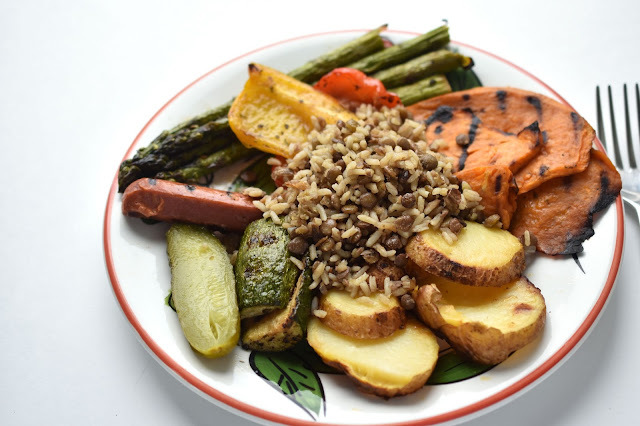 Although I have been trying to eat lots of fruits and veggies, I like the idea of consuming this for added nutrients when we're on the run, as we have been lately with my daughter's dance performances. Since it's new to me, I've been having just a third of a scoop per day, with a mix of water and a bit of apple juice for added flavour. I wouldn't say Greens+O tastes bad to begin with, but I like it better with the juice. 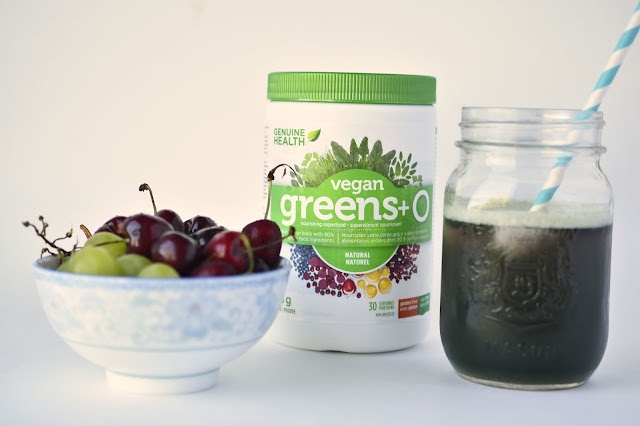 Vegan Greens+ O doesn't contain gluten, animal products or artificial colours, flavours or sweeteners. Now for a look at a full day of vegan eats. 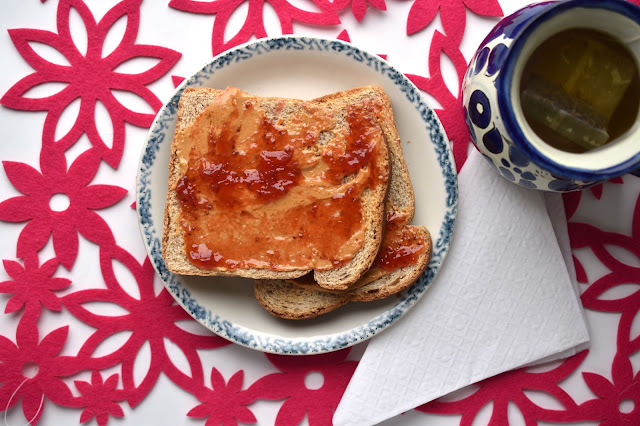 I started my Monday with some quick and simple peanut butter and jam on toast, with decaf green tea to wash it down. Not very inspiring but sometimes you have to go classic, right? For lunch, I had leftovers from our Sunday barbecue. I also had leftover lentils and rice from a gathering we had on Friday night. Oh, and a slice of pickle for a crisp contrast! 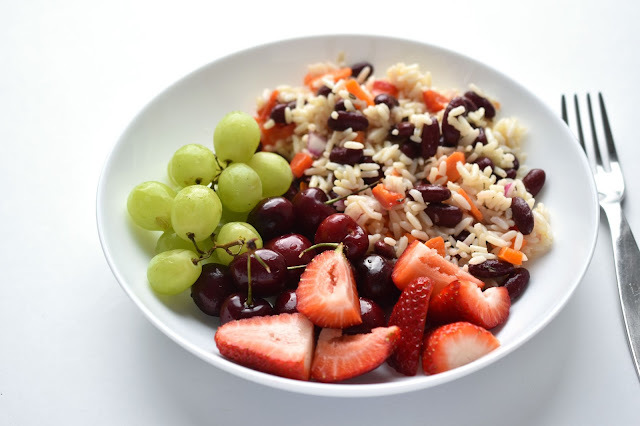 With dance recital practice on Monday evening, I cooked up some rice in the rice cooker and then my husband whipped together a quick rice salad with kidney beans, carrots, red onions and a vinaigrette while I went off to buy last-minute foot paws for our dancer. I had the rice salad with cherries, grapes and strawberries for dinner. Actually I had it all in little containers backstage at the theatre, but this is a photo of my lunch the next day. 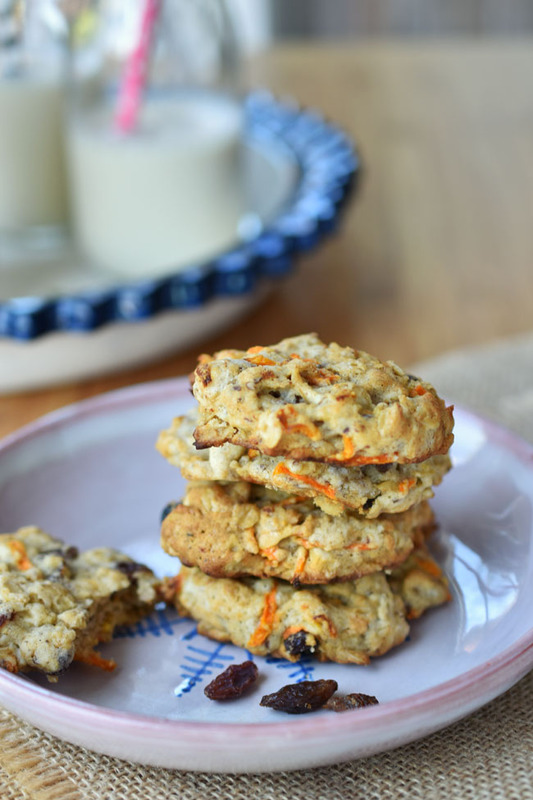 I ate quite a few of these Carrot Cake Oatmeal Cookies this week too! It's a new recipe on the blog. Check it out if you're craving a tasty cookie. Do you feel like eating lighter when it's hot outside? Do you take any greens supplements, protein powders or multi-vitamins? Linking up to WIAW, hosted at Sprint 2 The Table. *This post contains affiliate links. If you make a purchase after following a link, Woman in Real Life may receive a small commission. Your price is not affected. Mmmmm all these meals look amazing. I def eat a bit lighter when it's warm out. Probably because I find that I need to be drinking more water in the heat. So true on the water thing Patricia! Thank you! Great meals. Perfect ideas for warm days. Now I am hungry! Just out of curiosity what's in your hot dogs?